are symbols for our base biology. there is no misbehaviour there. That way of seeing's purely our perversion. 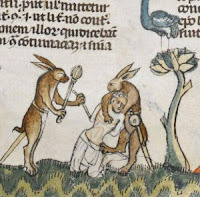 Reference material and some words taken from: Why Are There Violent Rabbits In The Margins Of Medieval Manuscripts?